Graffiti has a long history in Rome. Illiterate masses of ancient Romans relied on painted signs to navigate the market places. In the 1850s, Italy even coined the word 'graffiti' to describe the unsavory writing being etched into the walls of Pompeii. While carving your initials into the Colosseum is definitely still a no-no, Rome is having a real street art moment. Today, talented artists from Italy and beyond are helping to reinvent industrial Rome with an ever-expanding list of public murals. To see this less-explored side of the city, you sometimes have to head to the periphery, but some of the best street art is waiting in the most unexpected places if you keep your eyes peeled on the side streets of the Eternal City. Rome's Ostiense district sits beyond the historic centre, leading towards one of the city's largest universities. Just past the Piramide Metro B stop is a small street art haven. The most jaw-dropping artwork wraps around an entire building. This mural by Blu covers an abandoned barrack on Via del Porto Fluviale. Windows serve as eyes for the bright yet monstrous faces imagined by this artist from Bologna. 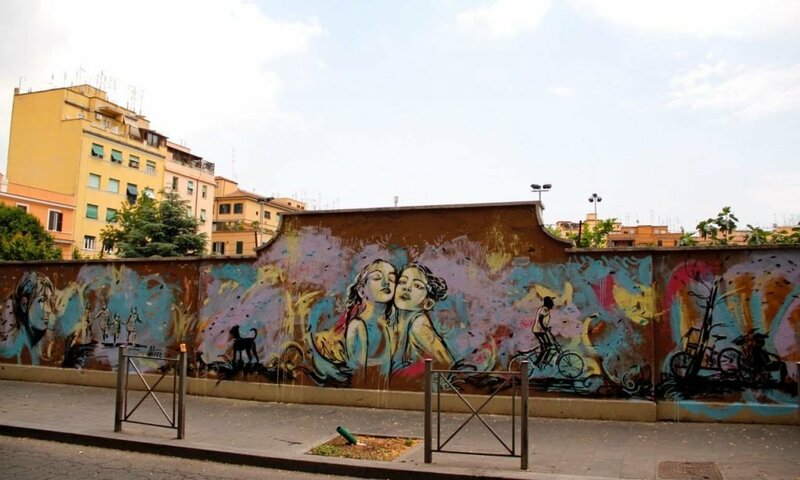 City walls and bland electrical boxes around Rome come alive under Alice Pasquini's colorful paint. The artist studied at the Academy of Fine Arts in Rome, and now works internationally. However, she still keeps a studio in art-friendly San Lorenzo and many of her female faces dot the neighbourhood. One of the best places to see her work is the block-long mural on Via dei Sabelli. Belgian street artist Roa dreamed up the 30-metre 'Jumping Wolf' on the side of an apartment building in Testaccio. 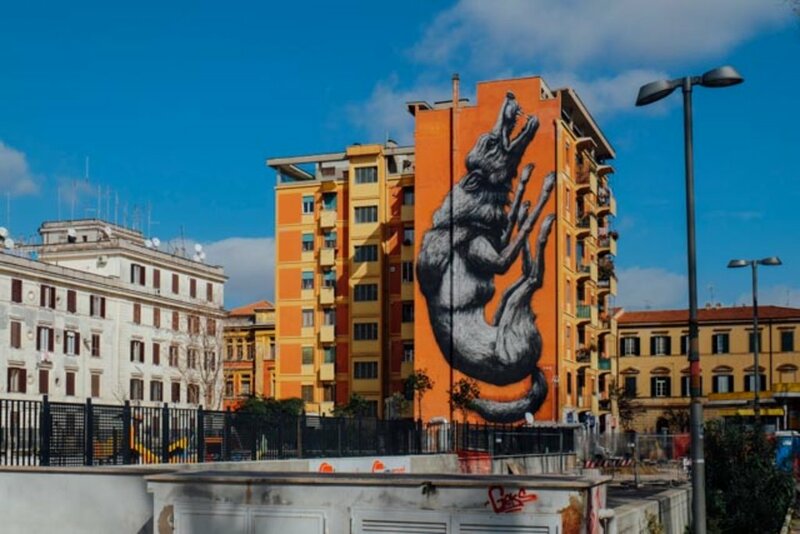 Known for his works of large animals, Roa's wolf is well suited to Rome - a city whose creation story includes a she-wolf who nursed the city's orphaned founder. Working-class Testaccio is also home to AS Roma's fan club, and the football team's symbol is... you guessed it: a black wolf. Rome is a city of hills. Walking through the centre, you will hardly notice the incline of the seven most famous hills where ancient Rome was governed, but you will certainly feel the burn if you trek up to the Gianicolo above Trastevere. There are flights of staircases to facilitate the climb, and this is where Diavù (David Vecchiato) immortalised a young Elena Sofia Ricci. 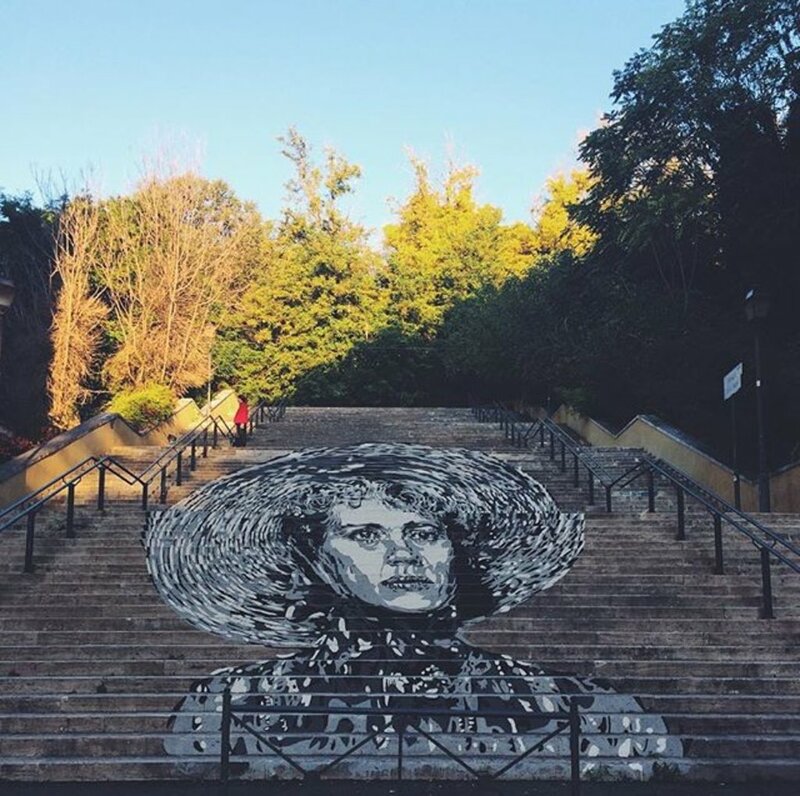 The Italian actress has been painted in black, white and gray up the steps on Via Ugo Bassi. Looking for more? 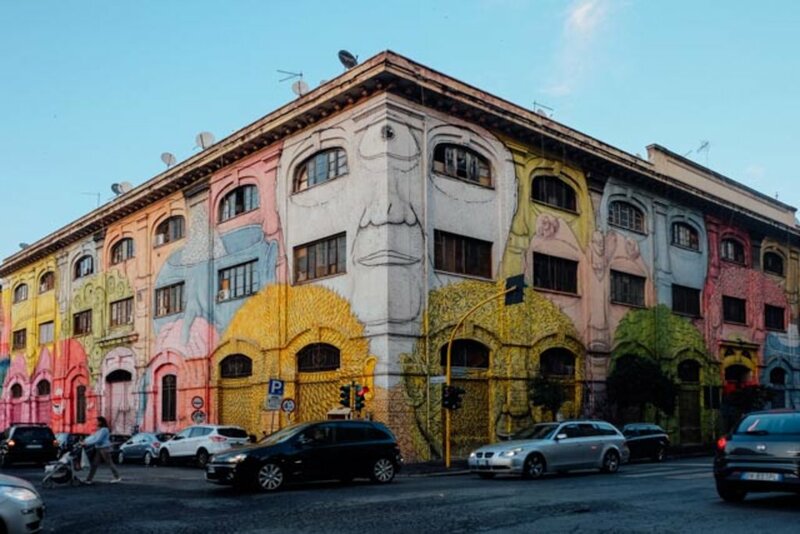 Adventurous art-seekers can take Metro B out to the Quadraro neighborhood to experience M.U.Ro- the Urban Art Museum of Rome. Founded by Diavù in 2010, this open-air 'museum' is a true street art neighbourhood. More than 20 murals can be discovered on the walls of Quadraro for free. All you need is a map. 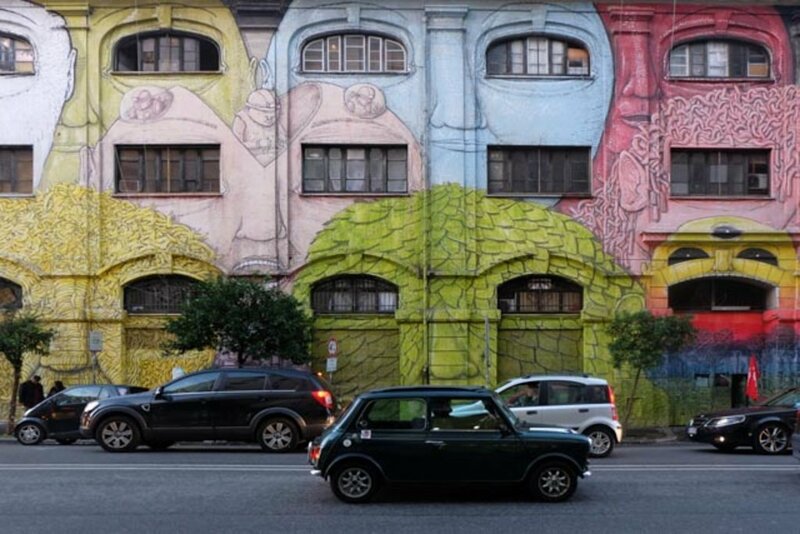 Ready to get acquainted with Rome's street art scene? Check out our hotel dealsto start planning your trip!